A non-dairy guilt free treat. Cut all Saba bananas into thirds lengthwise and roast them on a parchment lined baking sheet in a convection oven at 400 F / 200 C for 20 mins, flipping halfway through. For the Macadamia ice cream take 9 roasted Saba banana slices, the regular frozen bananas and macadamia milk and process in a food processor until smooth. Scoop into a bowl and freeze for 15 mins. 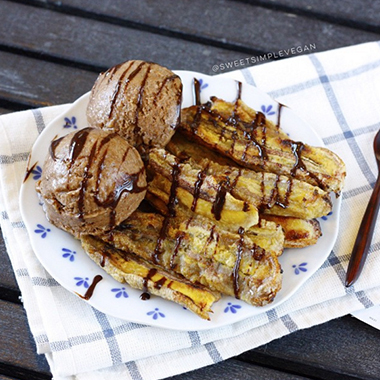 Remove from freezer and scoop onto a plate with an ice cream scooper along with the roasted Saba bananas. Mix all ingredients for the raw chocolate drizzle together and spoon over the plated up dessert.